August 2018: Following a freight train train derailment near Station Square, Allegheny Crane Rental was called in to help clear the wreckage. Pooling our resources with the Pittsburgh Port Authority and Norfolk Southern, the wreckage was cleared in just a few days. 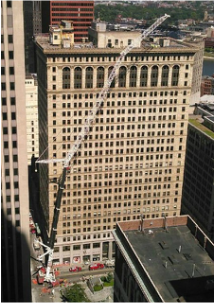 When a structure collapsed and turned into an emergency situation the teams at Allegheny Crane Rental and KP Builders knew what to do. The teams, lead by Kyrk Pyros, joined forces with the PA Urban Search and Rescue – Strike Team 1 to rescue those trapped and begin the emergency demolition process. We're utilizing a 440 crawler and a 275 all-terrain crane to lift and set these equipment pieces for a transportation company. October 2016: Devastating damage to the Carolinas and our team is there to help restore the lives of our fellow Americans. September 2016: Our Children's Hospital crane at it again. Setting a new HVAC unit on this project for our loyal customer. August 2016: With an onslaught of storms overnight wreaking havoc on the Pittsburgh area, the team was called with urgency to assess this building’s situation and quick remediation. 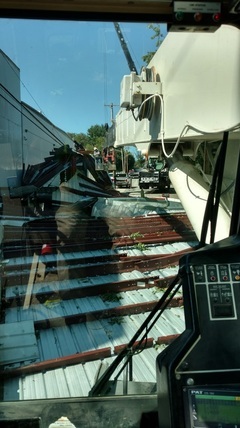 Upon speedy arrival, the team got to work removing panels and making repairs on the building which housed refrigerated goods. 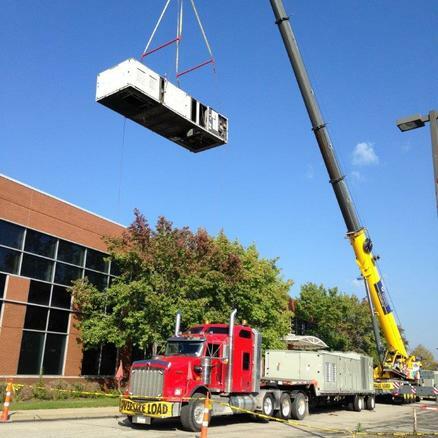 October 2015: The Verizon store in Warrendale needed a new air conditioning unit for their building. With a building this large a unit of proportional size is required. Few tools other than a crane could lift something this heavy, so Verizon trusted Allegheny Crane with the job. 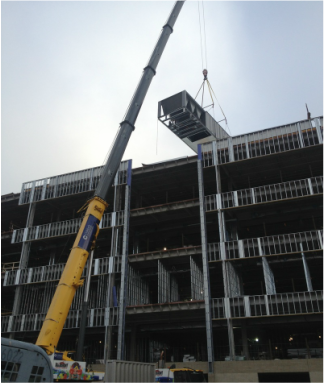 The job was completed quickly, safely, and cost-efficiently, with the use of our 275 ton Crane. 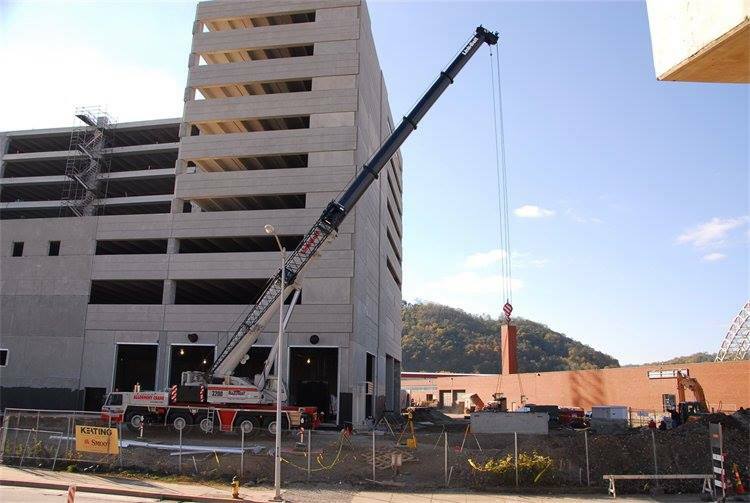 August 2015: Allegheny Crane orchestrated the lift of a new coolant tower for the Oliver Building. The tower belonged at the very top of the skyscraper, 323 feet in the air. The Oliver Building is over a century old and with a history like the one it posseses, no mistakes can be afforded. Allegheny Crane did what it does best, ensuring maximum safety and efficiency. The job was completed in just three days time without a hitch. 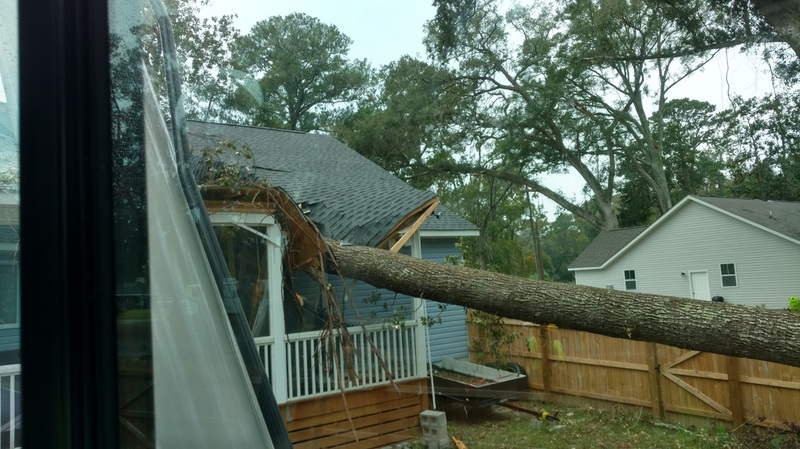 The estimates implied it taking far longer with number permits and preparation required. However, as always, Allegheny Crane pushed to go above and beyond what was expected. March 2015: A small plane, namely the Cessna 340, suffered an unfortunate landing accident. The only person in the plane was the pilot who was thankfully uninjured. The plane, however, had received enough damage to immobilize it. A crane was needed to move the plane to a safe location. The Butler Airport came to Allegheny Crane for the job. Using the 275 Grove crane, the crane operator and Kyrk himself safely lifted the crane back onto the runway. 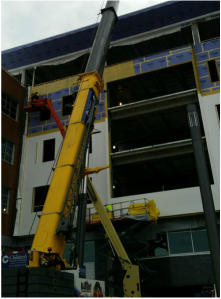 Spring 2015: Limbach Inc, one of the nation's premier mechanical contractors, hired Allegheny Crane for a job in Bakery Square, Pittsburgh PA. One of the buildings needed to raise their HVAC units as well as extremely heavy pipes up to the roof. This was an especially difficult job because of the busy nature of Bakery Square. Working around the schedules of the other businesses might have seemed like an impossible job to some. But as always, Allegheny Crane worked hard to ensure the job was done quickly and safely. Using the 90 and the 275 ton cranes the job was completed within just three months. 2008: Ruthrauff Sauer contracted Alleghany Crane for the Pittsburgh Casino. The project had a short deadline due to a two-month closure. During the planning process, the landscape of the original Casino project had changed. This meant we had to rethink our plans. Mark Huber from Ruthrauff Sauer said, Kyrk Pyros, Bob Stieghner, and the rest of the team dealt with the problem quickly and efficiently. 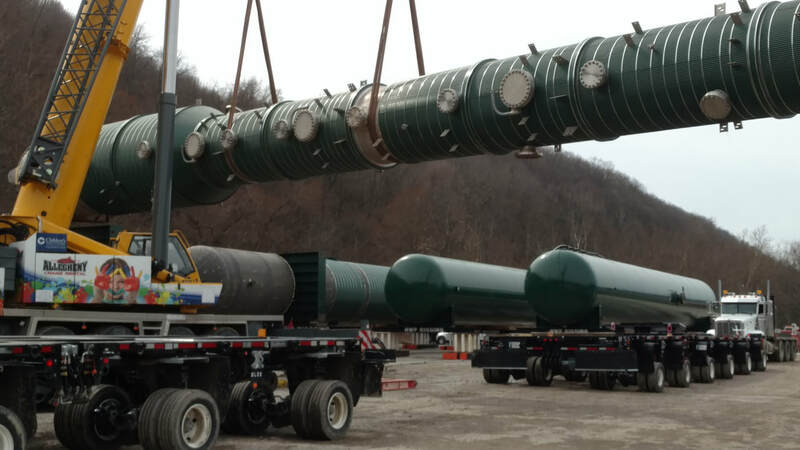 "Their [Allegheny Crane's] work ethic and hustle saved countless hours."